A Michigan man had been using what he thought was a large, 22-pound rock to prop open a door at his home for the last three decades — except it turned out to be a meteorite, and reportedly worth more than $100,000. The unnamed man brought the meteorite to Central Michigan University to be examined out of curiosity. Central Michigan University geology professor Mona Sibescu said that of all her time at the university, this is the first “rock” she’s tested that actually turned out to be a meteorite. “For 18 years, the answer has been categorically ‘no’ — meteor-wrongs, not meteorites,” Sibescu said in a Thursday statement, according to CNN. “I could tell right away that this was something special. “It’s the most valuable specimen I have ever held in my life, monetarily and scientifically,” Sibescu added, noting that the meteorite is composed of of 88.5 percent iron and 11.5 percent nickel. The Smithsonian Institution in Washington, D.C., corroborated Sirbescu’s analysis that the 22-pound “rock” is, indeed, a meteorite, and is apparently the sixth-largest of its type to be discovered in Michigan. Central Michigan University estimates the meteorite’s value at around $100,000. The man said that he was able to discover the meteorite’s origins, noting that he’d spoken with the farmer who’d originally discovered the space rock in the 1930s. When the original farmer and his father went out to examine the damages the next morning, they discovered a crater, and in it, the meteorite. The man, who lived on the farm for a few years, moved, and took the meteorite with him. 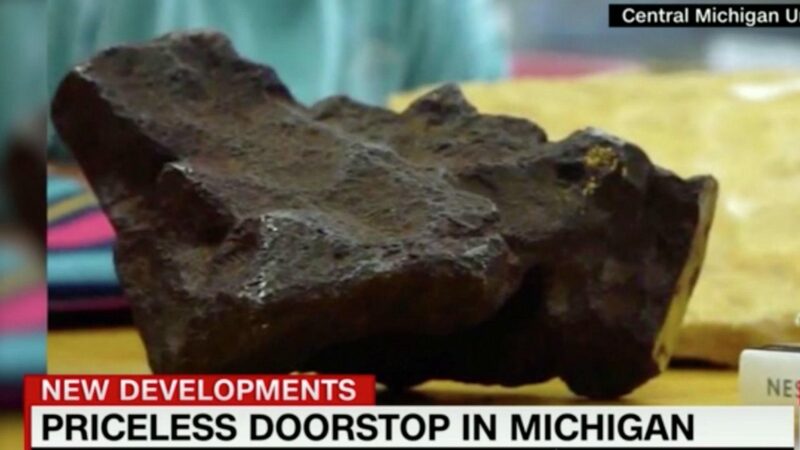 According to the report, the man had been using the meteorite as a doorstop for the last 30 years. He was inspired to have it checked out by the university after a rise in meteorite discoveries in Michigan. “What typically happens with these at this point is that meteorites can either be sold and shown in a museum or sold to collectors and sellers looking to make a profit,” Sirbescu said in a statement. The unnamed man is reportedly actively looking to sell the meteorite, but has not yet found a buyer. He has agreed to donate 10 percent of the meteorite’s sale price to Central Michigan University to go toward the studies of earth and atmospheric sciences, when and if it sells.